This blog seeks to document my research into the history of the Tyldesley family. A pedigree produced by Gillow and Hewitson in 1873 gives a useful overview of the family, though it is incomplete and contains some errors. I am particularly interested in the three individuals—Sir Thomas Tyldesley 1612-1651, his son Edward Tyldesley 1635-1685 and grandson Col Thomas Tyldesley 1657-1715. 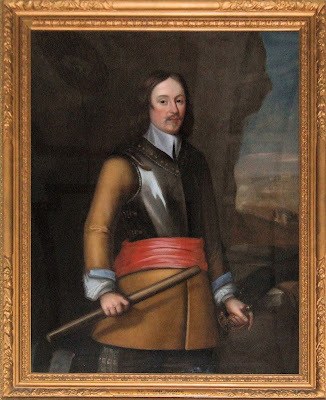 Sir Thomas Tyldesley 1612-1651 is the famous Cavalier, who may have been responsible for the first death of the English Civil War, who fought for Charles I at Edgehill and Marston Moor and who was slain at the Battle of Wigan Lane. A monument erected in 1679 marks the place he fell, and it is believed his remains lie under the central heating boiler in the Parish Church of St Mary the Virgin at Leigh. Edward Tyldesley 1635-1685, an "ingenious fellow", who may be found writing to Samuel Pepys, presenting Charles II with a white crow for the Royal aviaries in St James's Park and as a member of the embassy which brought Catherine of Braganza from Lisbon for her marriage to the King. Col Thomas Tyldesley 1657-1715, an ardent Jacobite who received a secret commission from James II and whose subversive activities were sufficient that a Royal Proclamation was issued against him by the usurper, William III. 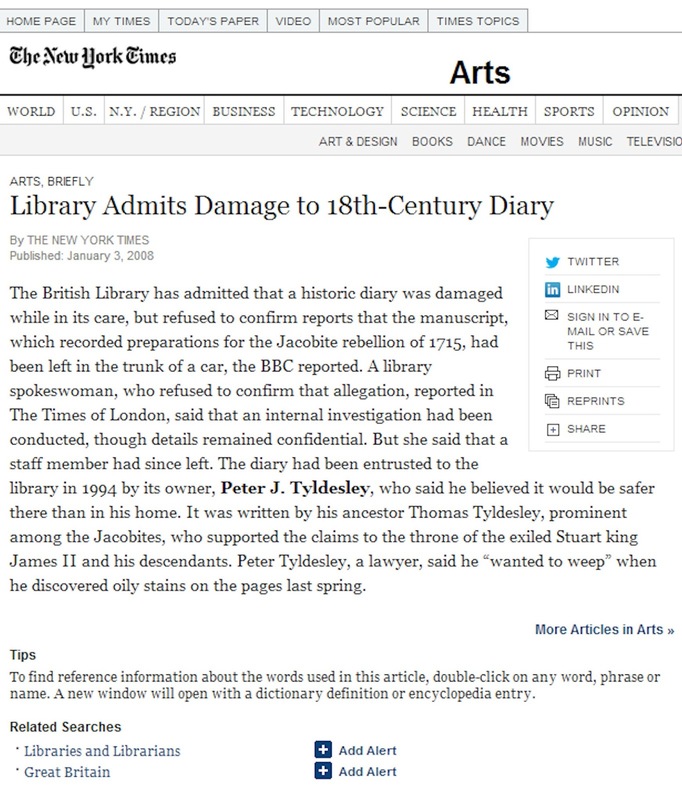 Thomas Tyldesley left a diary for the years 1712-1714, although as reported by the BBC, and by Dalya Alberge for The Times, this was badly damaged whilst in the safekeeping of the British Library. In the diary Thomas Tyldesley notes attending a pig roast to celebrate the death of Queen Anne in 1714 and having his sword and pistol repaired in preparation for the 1715 uprising. 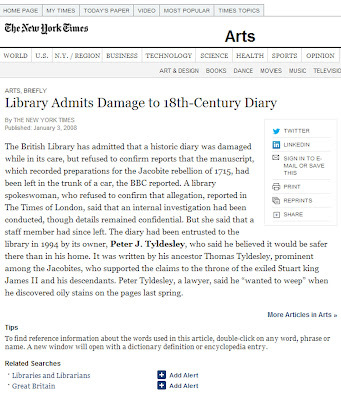 I am hoping to publish a new edition of the Tyldesley Diary 1712-1714 at some point in the future, though it is likely to be two or three years in preparation. This will be a project supervised by the leading Jacobite academic, Professor Daniel Szechi at the University of Manchester. In the meantime I shall be happy to hear from anyone with an interest in the family—there is a contact link in the right-hand column. The archives are ten minutes walk from Oxford Road station. In the course of a few years (between 1726 and 1730) the professions were received of Dame Mary Scholastics Haggerston (so called in distinction to Dame Scholastica Stanley), and Dame Mary Michael Tyldesley. The latter had given great proof of her constancy to her vocation, for whereas she had long been wishing to give herself to God, the circumstances of her family obliged her to defer the fulfilment of her wish for some years. 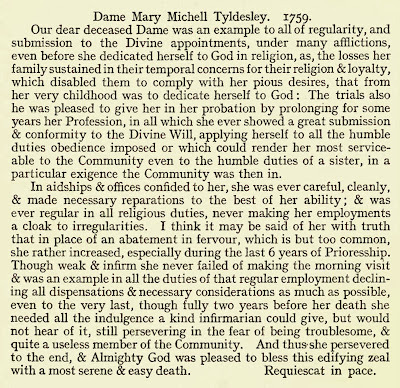 It is well known how much the Tyldesley family had to suffer in fines and penalties for their religion and loyalty to the exiled Stuarts, and our monastery not being sufficiently provided for to take subjects without portions, it was some time before she was able to present herself to the novitiate, but her patience was at last rewarded. Dame Maura Fitzwilliam, Dame Anna Westby, and Dame Constantia Howard passed away during the few years of which we are now speaking. 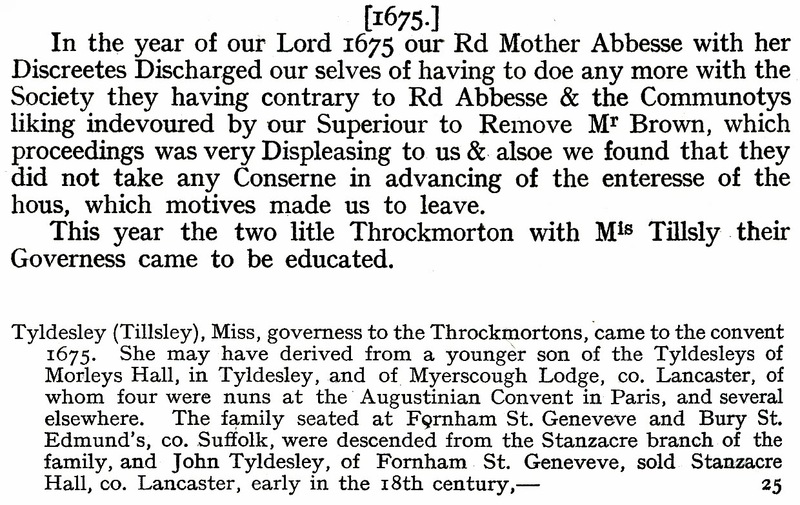 ...This year the two litle Throckmorton with Mis Tillsly their Governess came to be educated. 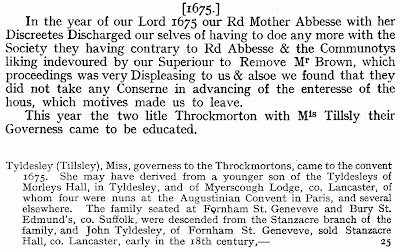 The footnote, probably written by Joseph Gillow, suggests that Bridget Tyldesley was from the Fornham St Genevieve branch of the family. However, the only Bridget Tyldesley known from that branch was born after 1675, and married Francis Hanne of Deviock in Cornwall—as noted by Gillow in an earlier volume published by the Catholic Record Society.